This series invites today's Christians to experience in a new way the power of each Passion narrative. Each book follows the same format. The opening section shows how the rest of the Gospel prepares for the Passion story. 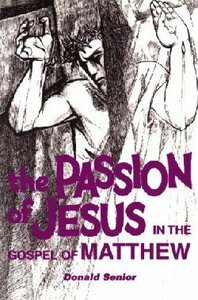 The second and longest section is a detailed analysis of the Passion narrative itself. The concluding section synthesizes the theological motifs that dominate the Passion narrative to suggest some implications for contemporary experience. - Publisher The passion is the climactic event in each of the gospels. These volumes elucidate the passion in its historical background and explore its theological breadth and depth. About "The Passion of Jesus in the Gospel of Matthew"
The passion is the climactic event in each of the gospels. These volumes elucidate the passion in its historical background and explore its theological breadth and depth.